Increasingly, almost everything we do in our daily lives is being influenced by information and communications technologies (ICTs) including the Internet. The task of governance is no exception with an increasing number of national, state, and local governments utilizing ICTs to support government operations, engage citizens, and provide government services. As with other things, the process of governance is now being prefixed with an “e”. E-governance can range from simple Web sites that convey basic information to complex sites that transform the customary ways of delivering all sorts of government services. In this respect local e-government is the form of e-governance that specifically focuses on the online delivery of suitable local services by local authorities. In practice local e-government reflects four dimensions, each one dealing with the functions of government itself. The four are: (a) e-services, the electronic delivery of government information, programs, and services often over the Internet; (b) e-management, the use of information technology to improve the management of government. 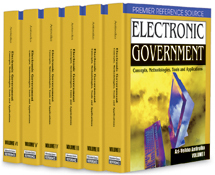 This might range from streamlining business processes to improving the flow of information within government departments; (c) e-democracy the use of electronic communication vehicles, such as e-mail and the Internet, to increase citizen participation in the public decision-making process; (d) e-commerce, the exchange of money for goods and services over the Internet which might include citizens paying taxes and utility bills, renewing vehicle registrations, and paying for recreation programs, or government buying office supplies and auctioning surplus equipment (Cook, LaVigne, Pagano, Dawes, & Pardo, 2002). Commensurate with the rapid increase in the process of developing e-governance tools, there has been an increased interest in benchmarking the process of local e-governance. This benchmarking, which includes the processes involved in e-governance as well as the extent of e-governance adoption or take-up is important as it allows for improved processes and enables government agencies to move towards world best practice. It is within this context that this article discusses benchmarking local e-government. It brings together a number of discussions regarding the significance of benchmarking, best practices and actions for local e-government, and key elements of a successful local e-government project.